Sitting at the office working on some last minute projects before I leave here for good in FIVE more business days! I’ve got a project that has been making me nuts for over a week now. Unfortunately it isn’t something that I can debug/test run in a development environment, or even easily deploy to an accessible QA. Noooo. Not this. I code it blind, compile, deploy to a share and then have to have the release engineers deploy it to our staging environment. Which, btw, they only do two times a day. Only to add a delete button to an archived forum thread on a platform that is going away in the coming months. Big fat annoying waste of time. Almost done. Almost done. So last night I get home to find that while the power was still on, FIOS was out. That means No Phone, No TV and no Internet. Bummer. Was planning on streaming stuff or catching up on what I missed last week using On Demand. How did I spend my night then? I spun to the DVD. I’d seen this movie years ago and bought it not too terribly long when I spotted it on DVD. After Jobs passed away, I dug it out and put it on the top of the DVD pile to watch. And watch it I did last night while I finished up the remaining bobbin of Forbidden Woolery falkland that has been languishing on the Matchless for far too long. I realized after digging through my own blog archives (does anyone else periodically read their own old stuff?) that I used to spend Tuesday evenings spinning. I’m going to have to reinstate that habit! 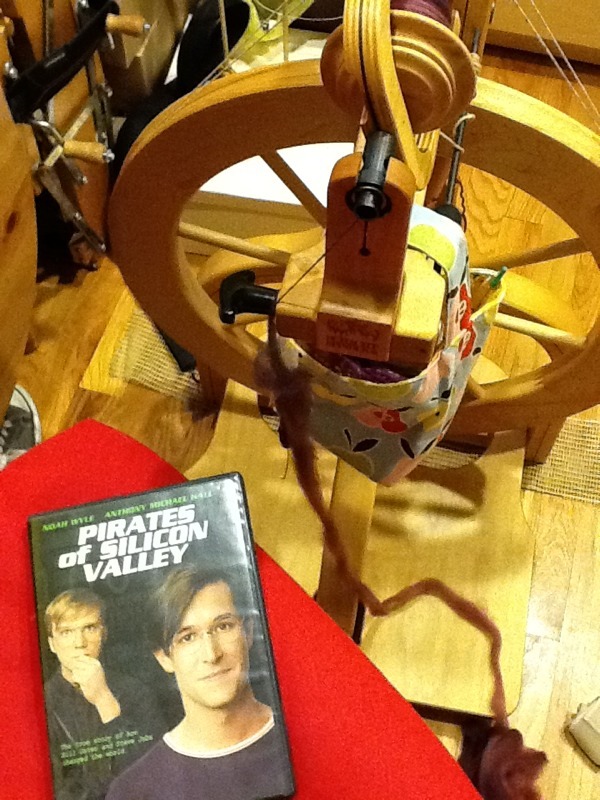 I don’t nearly spin enough, especially to justify the wheel hoard and massive fiber stash!